The story's unreliable narrator, Montresor, tells the story of the day that he took his revenge on Fortunato, a fellow nobleman, to an unspecified person who knows him very well. Angry over some unspecified insult, he plots to murder his friend during Carnival when the man is drunk, dizzy, and wearing a jester's motley. 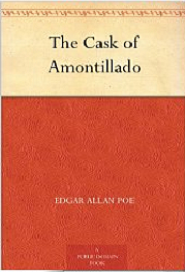 He baits Fortunato by telling him he has obtained what he believes to be a pipe of a rare vintage of Amontillado. He claims he wants his friend’s expert opinion on the subject. Fortunato goes with Montresor to the wine cellars of the latter’s palazzo, where they wander in the catacombs. At one point, Fortunato makes an elaborate, grotesque gesture with an upraised wine bottle. When Montresor appears not to recognize the gesture, Fortunato asks, “You are not of the masons?” Montresor says he is, and when Fortunato, disbelieving, requests a sign, Montresor displays a trowel he had been hiding. When they come to a niche, Montresor tells his victim that the Amontillado is within. Fortunato enters and, drunk and unsuspecting, does not resist as Montresor quickly chains him to the wall. Montresor then declares that, since Fortunato won’t go back, he must “positively leave”. Montresor walls up the niche, entombing his friend alive. At first, Fortunato, who sobers up faster than Montresor anticipated he would, shakes the chains, trying to escape. Fortunato then screams for help, but Montresor mocks his cries, knowing nobody can hear them. Fortunato laughs weakly and tries to pretend that he is the subject of a joke and that people will be waiting for him (including the Lady Fortunato).